Pennywise, from California’s Hermosa Beach, started back in 1988. From humble beginnings playing backyard parties, the band now tour the world, playing to the masses. With 11 full-length studio albums under their belt, it’s now time to celebrate the 20th anniversary of one of their more popular, About Time. The band will be travelling to Australia to celebrate this anniversary and will play the album in full. The tour in September starts in Brisbane and travels around the country, wrapping up in Perth. On a hot Californian afternoon, vocalist Jim Lindberg spoke with Caught in the Mosh about the good old days, cover songs and the possibility of new music. You’re heading back to Australia for what seems like the millionth time. Setlist.fm says you’ve played more shows here than anywhere else outside of the US. Do you guys like it here or something? I guess so! (laughs) Well, you kinda go where you have people wanting to see you. I think it has a lot to do with you being a coastal nation and we’re the same, here in Hermosa Beach. We have similar interests, with a lot of focus on the ocean and I think that translated, obviously, with things, like you were saying, the Taylor Steel Good Times tours and surfing in general, so... anywhere there’s strong crowd like that we seem to want to visit more often than the places like Siberia, where no one cares about Pennywise (laughs). But it’s good to get down there. We generally have a good time. We love the people and the culture down there. Besides California, I’d say Australia is definitely our favourite place. You’ll be here for the About Time 20th Anniversary tour. Australia seems to be the only place getting the tour. When bands do album anniversary tours, they generally play that record in full. Will you be doing the same? Yeah, we’re going to attempt it (laughs). We’re planning... As we’re working on a new record, we’re also going to do... We’re planning on doing some shows in Los Angeles where we’re going to do the first three albums. And for Australia, we decided that About Time was probably one of our biggest records there so we figured it would be good to focus on that one while adding in songs from other early albums. We’re going to play as much of About Time as we possibly can. It’ll probably be in its entirety but we’re still going through all the songs to make sure we can hack it after all these years (laughs). But we always play a good amount of songs from that album anyway so there’s just a couple that don’t make the setlist that we’ve got to brush up on and make sure we can pull them off. The tour also coincides almost exactly with the 20th anniversary of your first Australian headline tour, the December 1995 Good Times tour with Blink 182. Do you look back at that tour with fond memories? Any stories where, when you think about them, you can’t help but smile? Definitely. There was a lot of fun shows and crazy stuff going on with the guys from Blink, who are great friends. At that point, for all of us, it was really just a carefree time and I think that tour was an example of a bunch of really young-at-heart, immature people being let loose on a country to do whatever we wanted to do, which was to surf and play shows. And drink way too many beers and have a good time. I remember one drive home from a show when Tom, I think, from Blink had over celebrated and we had to drive home, with both bands in a van. I remember he was very close to spewing and we were all coming up with different kinds of disgusting things to think about, what kind of foods he should think about, to try to get him to puke. Once the van stopped he finally did puke (laughs). So it was a success. Going from old tunes to new ones, sort of; you released Yesterdays last year. Can you tell us why you released a “new album of old songs”, versus an album of completely new material? Well, obviously, I had just come back to the band and this was something we had talked about for along time, about re-recording a batch of these old songs that we had from when we first started, from before we even signed with Epitaph. They’re all really cool songs. And then we were talking about doing a vinyl boxset and making these (new recordings) part of that boxset and have this like a bonus side. But Epitaph, at the time, decided they wanted to wait on the boxset and just put out these old songs and a collection of b-sides. So we decided to do it that way. I still definitely want to do the boxset idea, to have a collection of all our albums, with Yesterdays added in there. But at the time, the album on it’s own seemed the like the thing to do. And it was interesting to be able to add in... The last track on Yesterdays is (a recording of) a practice, which is really one of our first or second ever practices together. It’s us going through some of the songs you hear on the record, recorded back in a small garage in Redondo Beach. It’s a good little postcard from that time. We always wanted to record those songs in the studio but never had a chance to, so it was a fun opportunity to go back to that time with Jason (Thirsk) when we were just starting out. We had all these cool fun punk pop songs. That was what the band was like before we signed a record deal and started taking it more seriously. Any reasons why the tracks weren’t recorded and released back in the day? Yeah, it was kinda strange. We had this group of songs and... I think we had probably 10 songs that we were playing at parties and things like that and we started to get a real following going over the course of about a year of being together. Then we started writing a new batch of songs, like 4-5 songs, songs like Living for Today, Wouldn’t it be Nice, Rules and Come Out Fighting. I think we could tell that the newest batch of songs was different from that first group and that’s when Epitaph offered to sign us for a record deal. I think we started really trying to update our song writing and maybe polish things off a little more than they were before, when it was us just goofing around in the back yard and things like that. But I really like those first songs a lot, especially some of the first tracks that are on the Yesterdays record. Thanksgiving and Restless Time were some of the first songs we ever played together, so it was really cool to get that album out. The opening track on Yesterdays, What You Deserve, was previously titled Starkey. Were there many changes to the songs or did you remain pretty faithful to the original recordings? As far as lyrics and titles are concerned, we were pretty faithful. Except that one song. There’s a little bit of politics involved in that one. That song was written by Jason about a local police officer here who was convicted of having his way with a female prisoner and it... there was some debate over whether it was a mutual situation or not but it was always rumoured that someone had, ah, basically offered certain favours to get someone out of jail. It was a strange situation and we were kind of... Jason had written a song about it but we decided not to make it about any certain individual person. But at the time we were definitely taking exception to the law man taking the law into his own hands. But yeah, it’s a really cool song. It’s fun to play; it’s got great harmonies. You mentioned a moment ago the Pennywise boxset. Is it still going to happen? Do you have any updates? You know, I... That’s becoming a top priority for me. It was kinda sore subject at the time. I really wanted it to happen... Epitaph is a strange label in that regard. I thought it was full speed ahead on it and then all of a sudden I was told that they didn’t want to do vinyl at all because vinyl doesn’t sell or something like that. I was mainly thinking it would be something really cool for our fans. But since that time I’ve seen a lot of our peers do it, so hopefully their thinking will come around on that and there’ll be a boxset coming out soon. I put a lot of effort into trying to pick the songs and coming up with artwork and things like that, but it just got shelved. I don’t know, between our management and the people at Epitaph it didn’t end up happening. I was pretty disappointed about it. I still am. But I’ll just have to talk to them and get a feel on whether it’s something they want to do or not. But I think vinyl’s having a real resurgence. I know my kids and a lot of my friends are collecting vinyl and it seems to be a great way to listen to music. I don’t see why we can’t get a release that highlights our whole history. So I hope it happens! I’ve got my fingers crossed. If Epitaph doesn’t want to do it then we’ll probably just do it ourselves (laughs). Well, vinyl sales are certainly on the way up. Yeah! It’s strange. I watch my kids listening to music on their laptops through streaming services and it just sounds horrible. Listening to music on tiny little computer speakers through a streaming service... it’s just... I can’t imagine... You know, growing up, my parents had a giant stereo system with huge speakers and the music just sounded so warm and powerful. To listen to it, sounding so tinny and crap... It’s just beyond me. It’s really cool when they can put on a record on the big stereo and listen to music as it should be heard. Do you think we’ll be hearing any new new Pennywise music any time soon? Ummm, I want to. I have some songs. I know Randy has some songs. Fletcher says he has some songs. It’s very important for me to be constantly writing songs and music and putting music out there. We’ve had a couple of meetings with everyone to talk about when this is going to happen and everyone seems responsive. But over the last year or so Fletcher did a project with Justin Thirsk (brother of original bass player Jason) called Chaos Delivery Machine and I did a project called Wraths with some friends here. I think it’s a huge priority to put out new music. I definitely want to be doing it, so it’s up to us to erase some touring from the calendar or set up some time so we can get in there and work on something great. I think we owe it to our fans to continue to come up with new music that is timely and will get everyone excited about the band again. If it were up to me, we’d be in the studio right now. But it’s hard to get four guys with a lot of different things going on, moving in the same direction. Hopefully those problems we’ve had in the past don’t come back to haunt us because it was really frustrating for a long time, getting everyone to agree on when, where and how to record... Everyone has strong opinions on how this should happen. Well, the lyrics from Bro Hymn say, “We can conquer anything together, All of us are bonded forever”. Is that the feeling in the Pennywise camp again? (Laughs) I hope so! It is on stage. And it is when we look at our history together. And it is when we realise what is important to us. And that’s kinda why I came back to the band. To recapture that. It takes everyone to put all their effort into putting the band first in a lot of situations. It’s difficult though. We have a long history. We had a lot of conflict and you have to find ways to look past that. And it’s not always easy. But right now, everyone’s getting along. We just did a tour with Danzig and I think we’re playing better than ever. We just have to get into the studio and put out something we’re really proud of, to find that spirit that was lacking before. You’ve played a heap of covers live. I remember seeing you play Nirvana’s Territorial Pissings on your first ever Australia tour back in 1995. What goes into choosing a song and how do you decide which ones to play live? Well, everyone comes up with different ideas and we throw out different ideas for cover songs. We’ve done the Beastie Boys. We do a lot of covers of bands form Hermosa Beach because there are so many great bands that came out of the south bay of Los Angeles and we like to pay homage to them. Also, it could be any band we’ve listened to growing up, that inspired up to play the kind of music that we do. Recently we’ve been playing a Bad Religion song because obviously they were a huge influence on our style and the way we do things. Nirvana was just a perfect example a band that completely changed the fabric of the alternative and punk rock scene for the better. They got rid of a lot of really phoney music that was going on at the time and instantly made that scene seem a little lame. So we always play that song because it really is taking the piss out of the whole situation. That was such an incendiary band, so powerful. It’s really great to be able to pay tribute to Kurt and the guys and the great song they wrote. But in general, we just like to do things that’ll throw people off guard. Or give them something that got them excited in the past or something irreverent, our own take on things. For Australia we did the Down Under song. We’ve done Hey Ya! by Outkast before. We’re always trying to do something weird. Also a lot of Beach Boys songs and things like that. It’s always a challenge to come up with something new but basically, when we go out there, we fight like crazy over which ones we’re going to do that night. We usually end up not knowing until we go out on stage which one it’s going to be and we let the crowd decide for us. Will we hear Land Down Under in Australia again in September? Good to hear! It’s a while off yet but still, good luck for the tour. Looking forward to seeing you back in Australia. Thanks for your time. 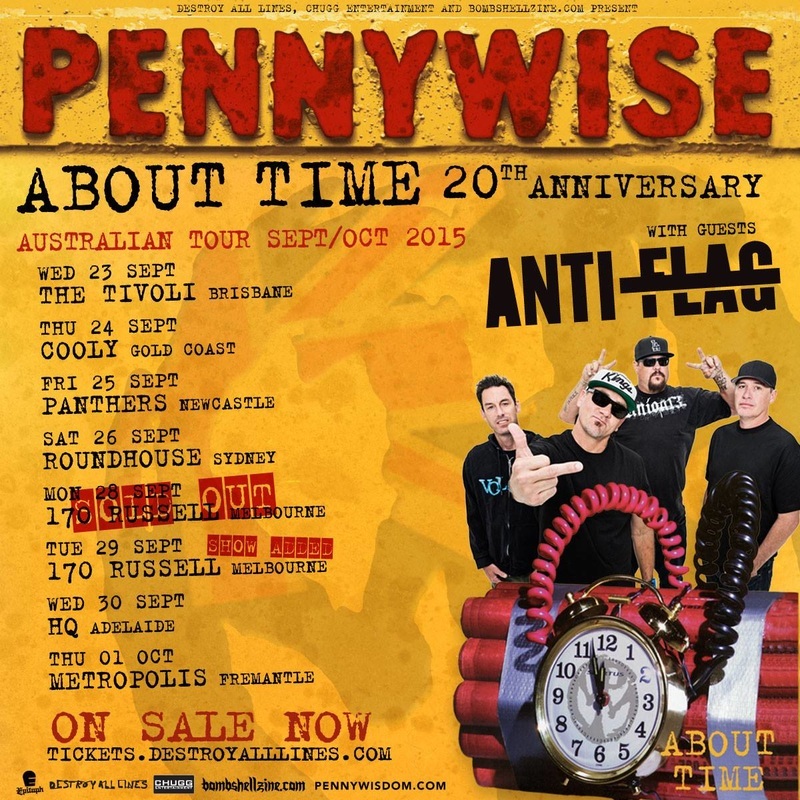 Catch Pennywise as they celebrate About Time's 20th anniversary with shows around Australia this September.